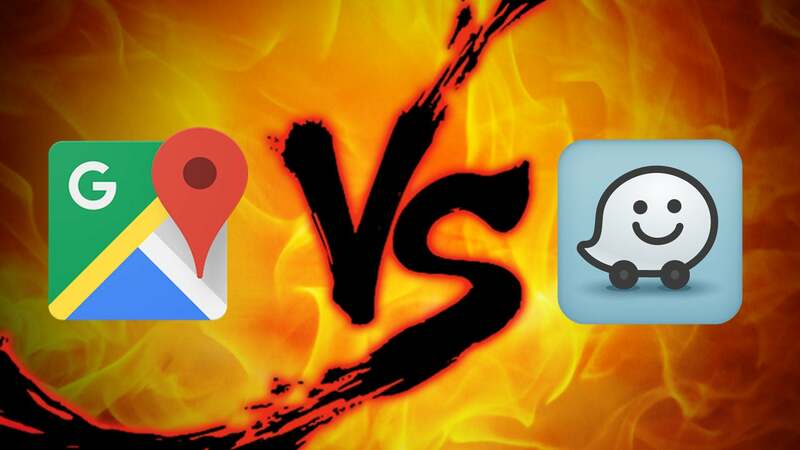 We'll dig into the big differences between Google Maps and Waze in a second, but let's quickly run through the broad strokes. Waze is a turn-by-turn navigation app that focuses on a social network where drivers can share information about accidents, police officers, road closures, and more. It is solely for navigation by car. Google Maps is much more akin to a traditional map, has a variety of transportation options, and is packed with additional information about businesses, monuments, and everything else you're used to seeing in a map app. Back in 2013, Google bought Waze, but has kept Google Maps and Waze separate for the most part. They share data occasionally, but otherwise they're totally different apps with different functions and different navigation tricks. For those curious, we're skipping Apple Maps since it's limited to just Apple devices. Though, while Apple Maps was certainly a joke when it launched, it's caught up well enough and tends to be comparable to Google Maps in major cities. 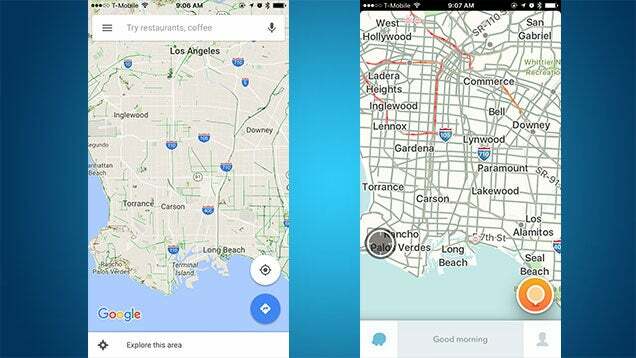 Google Maps (left) looks like pretty much every map, ever. Waze (right) really stresses roads. 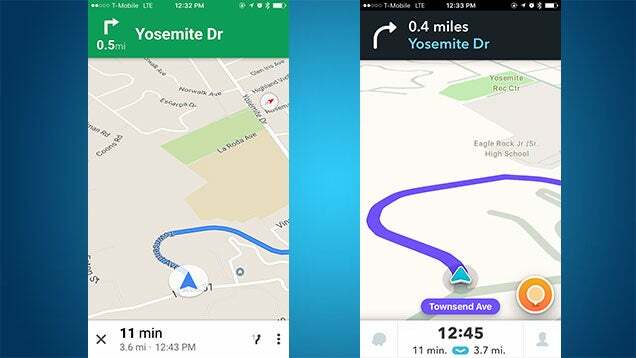 Both Google Maps and Waze do a fine job of turn-by-turn voice navigation, but let's take a look at the big feature differences between the two apps. That's it for the big stuff, though there are plenty of nitpicky, minor differences as well. Surprisingly, Waze actually has a lot more options for customising navigation, including setting Waze to avoid highways by default or take the shortest route instead of the fastest, so if you like to tweak your defaults, Waze is a better approach. Driving with Google Maps (left) and Waze (right) is a surprisingly different experience. Google Maps is a traditional map interface, like a digital version of a paper map. Waze is a traditional turn-by-turn navigation interface that looks a lot like a GPS unit you'd put in your car circa 2005. These interface differences don't seem like they'd be a big deal for people, but they really are, and the usability of both apps depends on what you plan on doing with them. When you take a look at Waze, it's pretty obvious it's meant for driving. When you search around the map, it's just roads. Nothing but roads. When you pop into the search menu, you can type in an address or a business name, then Waze gives you a route. You can change the route, by looking at text description or a map view. Once you're driving, Waze pans the view and zooms in, much like a traditional turn-by-turn GPS unit you'd keep in your car. Waze shows you your next turn in a big bold note at the top of the screen, with the turn after that one listed below. As you're driving, Waze displays things like police location, broken down cars, accidents, and road closures on the map. Waze is all about shaving time off your drive, so it will often take you on smaller roads or force you into weird u-turns in order to "shorten" your drive. It does all this automatically, using live traffic data to keep your route updated without you needing to do anything. Google Maps has a lot more in the way of navigation options. You can search for a specific address, a business name, or even just a type of business (like "coffee shops" or "Italian restaurants"). From there, you can take a look at the area in Google Street View, glance at user photos, or read reviews of the businesses in the area. Once you're set and ready to navigate, Google Maps lets you pick between a number of different transportation options, including walking, public transit, biking, as well as driving to get you to your destination. When you pick the driving option, you're shown a variety of routes on the map, all with different ETAs. This makes it easy to pick the route option that's best for you. Like Waze, once you're on the road, it tilts the camera, shows your next turn in a big overlay at the top, with a smaller overlay beneath that with the following turn. Google Maps also has lane designation, so if you're driving on a highway and get to an intersection or an exit ramp, it will tell you which lane you need to be in. Google Maps tends to keep you on major roads instead of pushing you over to side roads like Waze (though you can tell Google Maps to avoid highways, tolls, and ferries if you like). It also doesn't automatically update your route if there's a traffic even while you're driving. Instead, if it detects a traffic jam and wants to reroute you, you can chose whether to accept that new route or carry on your way. This is pretty handy if you just want to keep the status quo instead of making five turns just to save yourself two minutes. That said, it's also a little annoying to get that pop-up when you're trying to drive. Aside from the traditional map view, Google Maps also lets you glance at traffic maps, public transit lines, bike lane maps, satellite photos, and terrain maps. This is great when you're familiar with a city and just want to check out the best way to get from point A to point B without using turn-by-turn navigation the whole time. Waze doesn't have any of this stuff. What Waze does have is ads, which you can't opt out of and get pretty annoying after a while. Thankfully, they only display when you're at a stoplight. Waze also has sponsored destinations that float to the top, which also makes searching a chore sometimes. 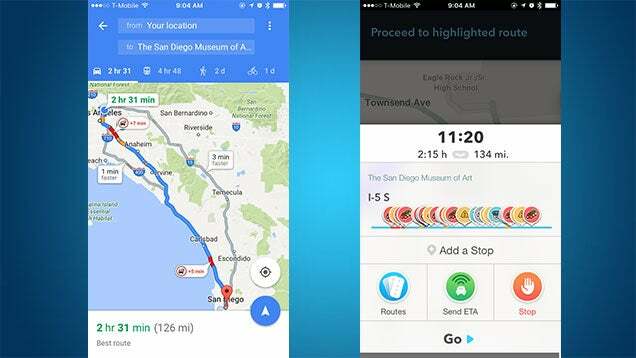 Google Maps (left) takes a more direct route, but Waze (right) gets you there quicker. If you live in a major metropolitan city and drive a lot, you'll probably want to keep both Waze and Google Maps around. Personally, I've always found Waze best suited for longer drives, mostly because Waze tends to take you on weird routes through residential districts just to shave off a minute or two in the city. Though, those few seconds might make or break you being on time, so it can be useful when every second counts and you need to get somewhere as fast as humanly possible. If you're travelling a little further, say 60 or 113km, Waze can often cut off a good thirty minutes from your drive. Waze is also much better at redirecting you around accidents, switching highways, or finding completely different routes when traffic is really bad. The social component comes in really handy when you're on long road trips. It's useful when Waze alerts you about congestion caused by an accident or a car on the side of the road, so it's easy to decide if you want to stay on a route or not. Likewise, the police reporting helps you keep an eye on your speed so you don't get a ticket when you're not paying attention. If you don't drive, don't even bother with Waze, as it's completely useless for anything but turn-by-turn navigation by car. Conversely, Google Maps is much better for neighbourhood driving. Its search makes it much easier to browse local businesses, and the larger map view makes it easier to see exactly what type of route it's taking you on. Plus, the fact you can easily swap between driving, walking, bicycling, and public transportation means it's a much more feature-rich navigation app. Google Maps' recent addition of lane designation is also incredibly handy in cities like Los Angeles, where the highway system seems designed by a drunk toddler on Adderall. Waze being the social app that it is means it's only useful in certain parts of the country, but when it has a big user base in a city, it really can get you to your destination faster. Google Maps is a much better all around app and its general usefulness far exceeds Waze. If you're just looking for a phone number for a business, don't own a car, or generally prefer a more paper map-esque experience, Google Maps should be your go-to. Good summary. In Melbourne, I use Google Maps 99% of the time because I ride my bike often, I know the streets very well, and it has so much more contextual information around Google Local / My Business. However, I used to live in Manila, Philippines which is rated as the worst city for traffic in the world according to Waze (even worse than Jakarta) and therefore there were many times when I used Waze in the back of a taxi because it could make a tremendous difference to the time taken for a trip, often to the surprise of the taxi driver themselves. I'll bet another key distinction between Manila and Melbourne is that Waze's takeup would be higher in Manila, making the social features more relevant. Oddly specific. Also, a mighty gap. How many Waze users are there in Australia? Are there enough for Waze to get useful traffic data? Also, some of points on the features of Google maps are not available in Australia, such as lane guidance (I was searching to find out why I couldn't see it, then found it's a US and parts of Europe thing). Google now has lane guidance in Australia. If you use Waze just watch out for refugee camps... Definitely the first mapping app responsible for injuring 11 people in a shoot out. I'm not convinced that there are enough people using Waze here in Australia to make its route guidance any better than the alternatives. Google Maps however seems to get it right every time regarding congestion and has often re-routed me around congestion with considerable time-savings. You don't get any warnings of police traps, but the ones in Waze are often dated from a week ago or more and so are irrelevant. How about "Maps.me". Anyone used it before? Maps.me is excellent - great for use overseas where you can use a saved version with turn by turn navigation using satellite rather than cellular - big savings on the roaming fees. Probably not quite as good as the Google for local navigation, but beats it hands-down for non-cellular use. Personally, I find Nokia's Here maps invaluable. The Offline data is a great help, since you can get a whole country worth of maps before a trip. Navigation has an odd tendency to try to zigzag down side roads though. It is somewhat annoying in Sydney with all the "no right turn" signs.